Throwing Away Money on Printing Costs? Today’s guest post is contributed by Cartridge Save, a leading online store specializing in ink supplies. I thought it gave some good tips that complemented my recent paperless office article. Whether in a home or office environment, running a printer can become an expensive affair. With ink, paper and supplies more expensive than ever before, those who do a lot of printing often find themselves spending a fortune over a year’s time. Fortunately, it’s possible to reduce the cost of printing without having to make any major changes, so long as you are aware of a few key tips. Here are 7 ways to reduce the cost of running a printer. Print Double-Sided – Most people don’t set their printers to print double-sided, simply because they aren’t aware that this is an option. The fact is, there are plenty of documents that get printed throughout the day that are used solely for reference and will never go out to a client. For documents like these, consider printing them double-sided. Not only will you reduce the workload of your printer, you’ll cut back immensely on paper waste, which can help to save costs. Reduce The Amount of Handouts – One of the biggest caveats of running an office is having to print an immense amount of handouts for employees, such as production schedules, memos and otherwise. Instead of handouts, stick to emailing your employees the information they need. Email is far less wasteful, is usually more organized and will help to save on printing costs in the long run. Shrink Your Documents – Sometimes documents get printed out far larger than they need to, which inevitably results in utilizing more ink and paper than necessary. By utilizing the “shrink to fit” feature in print-preview, you can drastically cut down on how much paper and ink you use when printing documents. After all, there’s no need to use five sheets of paper when you can use just two or three. Print Only the Important Segments – Many people print out entire pages worth of text when all they truly need is a small block. Instead of wasting the extra ink and paper, copy the segment that you need, past it into a simple document and print it out. This will not only help to save costs, but will also help to streamline your organizational skills. Refill your Ink Cartridges – One of the biggest costs associated with printing is ink; especially in an office environment. Some office blow through ink incredibly fast, only to purchase new cartridges like they’re going out of style. Instead of buying a new cartridge every time, consider refilling your own ink cartridges. Not only is the process incredibly easy, but you can literally cut your yearly printing costs in half by doing so. There are many kits and instructional tutorials that can be purchased that will show you exactly which steps to take to ensure you’re doing the job right. A properly refilled ink cartridge is just as useful and efficient as one that is brand new. Don’t Print Everything in Color – It seems like in offices these days just about everyone prints their documents in full color. Most of the documents you print out during a day will be used for textual reference, and color is usually not a necessary part of the equation. If you can get away with printing in greyscale rather than using color every time, you will inevitably save quite a bit of ink. Combine Sheets into One Page – People will often print something out, only to find that it takes up just a corner of a printed sheet. Instead of working in this way, combine multiple images or text blocks into one document. You’ll be printing the same amount of information, while utilizing far less paper in the process. 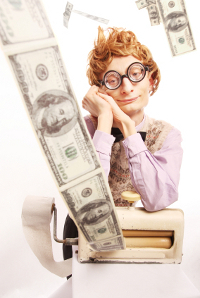 Printing is no doubt expensive, and has caused many an office to have to readjust their budgets year after year. So long as you follow the advice above, however, you can drastically cut down on your printing costs each year. One I don’t see on your list that we used to do back in the day was print in “draft” form. Basically it would tone it down so the printing wasn’t black-black but close to black. I haven’t done it for eons, but it’s somewhere under print quality I think. I haven’t had a printer at home since the dog chewed the cord about 2 years ago. Haven’t missed it at all. That’s a great tip, SMRM. A brilliant example of why we have comments. I hope readers are reading them. Thanks Lazy! One of the beauties of it is that you could set that as your default and then have to change it manually. Therefore being a “lazy” method – and like you, I’m all about the lazy. I have a printer at home but I switch it off unless I’m using it. Saves me a couple of bucks every month.